Andreas Killen is Associate Professor of History at the City College of New York and the CUNY Graduate Center. He has held fellowships at the UCLA Humanities Consortium and the Max Planck Institute for the History of Science. He is an editor and co-founder of H-Madness. This essay was posted earlier for Psychiatric Times. When Leo Alexander, the psychiatrist who served as advisor at the Nuremberg doctors’ trial, helped draft the articles of the Nuremberg code, his attention was drawn to two earlier episodes in German medical history. One of these occurred in 1931, when, following the deaths of 75 children in Lübeck by means of a contaminated TB vaccine, the Reich Health Council issued guidelines spelling out the principle of voluntary consent. Galvanized by the Lübeck affair and others like it, prominent physician Julius Moses had publicly condemned the “experimental mania” in German medicine, and by the time it met to discuss Moses’ charges, the Health Council was responding to considerable public outrage. Noting widespread popular belief that experimentation served the interests of scientific knowledge rather than those of healing, Council members agreed on the necessity of clearly defining the boundaries of permissible human experimentation. Yet these boundaries were by no means self-evident to the Council. In an effort to clarify the issue, Council member Alfons Stauder suggested that the distinction between experiments for therapeutic purposes and those purely for research purposes could be illustrated by reference to the practice of hypnosis. In the hands of a trained physician this method of treatment was invaluable, although it exercised such a “profound influence over the patient’s mental life” that it could only be used with due caution. Very different, Stauder continued, was the use of hypnosis by lay-practitioners, whether for the purpose of healing or for the sake of gratifying public interest in mysterious or unconscious forces. He stressed the danger such experiments posed and the disrepute such practices could bring to medicine. On the face of it, Stauder’s illustration of the general problem addressed in this session by reference to hypnosis seems surprising, even bizarre. Why did hypnosis appear in these deliberations? And why was it seen as so transgressive? Closer examination shows that, however seemingly tangential to the controversies surrounding the Lübeck affair, Stauder’s comments allude to a wider history of debates concerning the ethical and professional boundaries of medicine, in which hypnosis figured as a recurring theme. Another key moment in this history concerns an earlier scandal that erupted in 1898, when several people experimentally injected with serum from a syphilitic patient contracted the disease. One participant in the resulting controversy was Albert Moll, a specialist in neurology and hypnosis, whose book Medical Ethics (1902) Leo Alexander cited as a key source. Moll argued that this case was not an isolated one but indicative of wider abuses, including frequent instances of experimentation on patients in public hospitals. He identified several possible causes of such lapses: medical overspecialization and the resulting narrowness of doctors’ outlook; the growing knowledge-gap between doctors and patients as medicine was revolutionized by the natural scientific method; the greater prestige accorded research over treatment. He also suggested that physicians’ social status blinded them to the power differential between them and their often poor, under-age, or mentally handicapped patients. To prevent abuses, Moll suggested the need for a contract between physician and subject-patient spelling out, among other key issues, the principle of voluntary informed consent. Not surprisingly, given his own professional interests, Moll referred often to hypnosis in his discussion of medical ethics. Indeed it is quite central to his treatment of the doctor-patient relationship. The opening pages of his text included a warning concerning the dangers of hypnosis at the hands of lay practitioners, illustrating these dangers by citing the case of a woman who had to be institutionalized following treatment by a Hungarian hypnotist. Though he regarded such occurrences as unusual, Moll conceded in his text Hypnotism (1898) that the hypnotized subject was in fact “completely devoid of a will of his own,” and reiterated this view in his book on medical ethics. In Moll’s eyes, the hypnotic procedure carried clear risks, involving not just its apparent ability to penetrate deeply into the subject-patient’s psyche, but, in effect, to turn the subject into an object. A corollary to this was the great power it placed in the doctor’s hands. Hypnosis thus raised significant issues concerning the doctor-patient relationship. A precondition for the contract between doctor and patient, he wrote, was the existence of a relationship of trust: a consent given by the patient or patient’s guardian. This was precisely what hypnosis, by disabling the will and thus the very basis of voluntary consent, called into question. This special feature of the hypnotic procedure, therefore, was symptomatic of a larger problem plaguing modern medicine: that patients all too often were treated as objects — a fact raising questions about “the so-called voluntary nature of the consent that patient-subjects gave their physician-researchers.” In touching here on the issue of physicians’ treatment of their patients, Moll linked the problem of ethical violations to larger questions of public trust. Absence of trust harmed hopes of medical progress both by hindering public health policies and by strengthening the popularity of alternative medicine. Moll’s effort to find a middle ground between the patient’s interests and those of science initially found little resonance. Meanwhile, the critique of the natural scientific orientation in medicine spawned a lively medical counter-culture of alternative and esoteric healing, against which German doctors campaigned vigorously. This proved, however, no easy task, and became less so as a result of subsequent developments. During World War I, thousands of shell-shocked soldiers were treated with hypnosis. German military doctors’ discovery of its therapeutic properties gave hypnosis new validity. At the same time, the war amplified many of the issues that had surfaced in earlier debates. 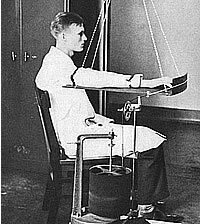 In some hands, the hypnotic treatment took on authoritarian features, making the patient’s submission to the physician’s absolute authority a part of the cure, and leading to conflicts between medical authorities and soldiers. Such conflicts were re-enacted in postwar films like The Cabinet of Dr. Caligari (1919), which portrayed the hypnotist as a figure of intense fear and fascination. During the 1920s, debates about hypnosis proceeded along several tracks. On the one hand, many doctors incorporated it into their clinical practice. On the other, controversies persisted concerning its still poorly understood workings, benefits, and risks. Malpractice charges were not infrequently filed against the many unlicensed hypnotists who flourished in the war’s aftermath. The campaign against lay medicine, or quackery, continued throughout the Weimar period. At the same time, in the polarized political climate of this era, many politically conservative physicians cultivated an image of themselves as charismatic leaders, claiming the right to administer ambitious, and sometimes radical, solutions to many social problems. Moreover, doctors continued to resist encroachment on their prerogatives, resisting efforts to impose stricter guidelines on experimentation, claiming that – as opposed to the problem of quackery, where intervention was justified – prospects for scientific progress demanded complete freedom. It was in this context that Julius Moses launched his attacks on the “experimental mania” in German medicine. In referring polemically to the Lübeck case as an instance of “medical quackery,” Moses challenged the claims of physicians like Alfons Stauder, the doctor who brought hypnosis into the 1930 Health Council deliberations, that German medicine stood on solid scientific foundations. Stauder was the head of two leading medical associations who had long used his position of influence to campaign against lay-healers. Convinced that his profession had adequate safeguards in place, Stauder argued that the worst abuses occurred in natural medicine circles. Nevertheless, in the outcry following the Lübeck affair, the Health Council issued new guidelines spelling out the limits of permissible experimentation and the principle of voluntary informed consent. These guidelines, however, had limited impact before the Nazis repudiated them in 1933. With the passage of laws legalizing involuntary sterilization of the mentally handicapped, the systematic violation of patient’s rights became institutionalized under the rapidly Nazified medical profession. What conclusions may be drawn from this story about hypnosis and its place in the history of debates about medical ethics? Though the issues surrounding hypnosis do not warrant comparison with the Lübeck case or the crimes tried at Nuremberg, the persistence with which German doctors wrestled with them over a period of decades suggests that these issues touched a deep nerve in the medical community. Hypnosis represented a special category, one that threw several problems confronting the profession into relief. Debates about hypnosis exposed a general lack of clarity surrounding the boundaries between treatment and experiment, as well as the boundaries between science and non-science, in other areas of medicine. Perhaps more importantly, hypnosis raised significant questions concerning the relationship between doctor and patient. Efforts to establish this relationship, and the wider relation between medicine and public, on the basis of the principle of voluntary, informed consent proved, in the deeply fractured political climate of the early 1930s, short-lived. It would take the verdict of the Nuremberg doctors’ trial, and the subsequent efforts of the psychiatrist Leo Alexander, to establish this principle at the center of modern medical ethics.